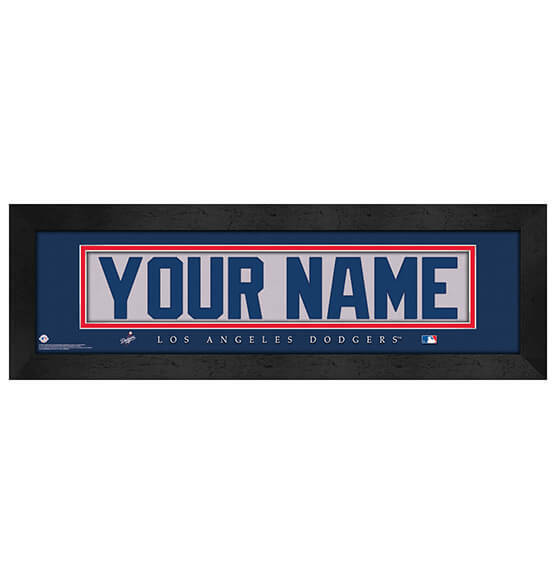 Our Los Angeles Dodgers MLB Personalized Nameplate Framed Wall Art will knock your gift-giving reputation out of the park. This easy-to-customize nameplate looks great in any fan cave thanks to its elegant high-quality frame, crisp team colors and full-color printed design. Add a name up to 12 characters to this framed sports decor. Crafted to look like the back of a Los Angeles Dodgers jersey, you can feel like part of the team. Do you bleed Dodger blue? Hang this good luck charm and cement your status as the number-one fan! This Dodgers wall art comes conveniently ready to hang with an attached sawtooth hanger.